Hello lovelies! I recently got my ninja-quick grabby hands on this wonderful taupe collection by Painted Polish, because TAUPE. There were a couple of polishes in the collection that were limited edition and have sold out already (their crellies always sell out fast!) so unfortunately they're not available anymore but one will be restocked tomorrow! I wanted to share them with you anyway because they are so shareable. Hey hey! I'm here with another shade for the March Polish Pick Up book theme. 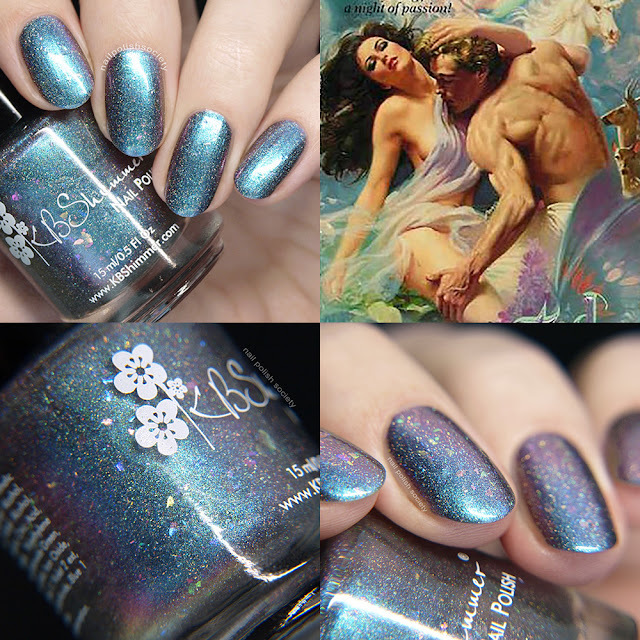 Christy from KBShimmer was inspired by this fantastical cover of a romance novel, otherwise known as a "bodice ripper". With a cover this ridiculous I can only imagine what the book is like! Haha! Hello and happy Monday! 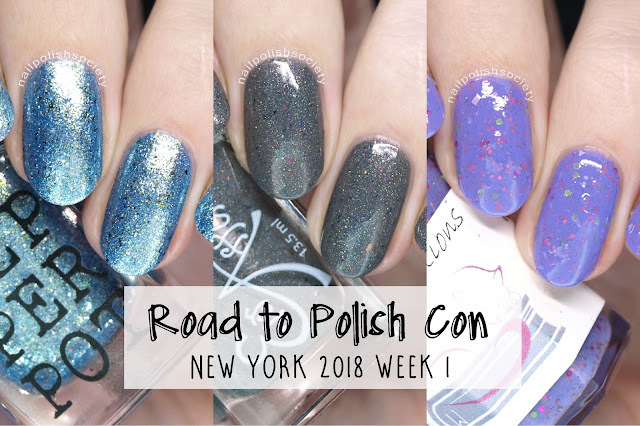 It's nearing the end of the month which means the Polish Pick Up is right around the corner! I don't know about you, but my wish list is getting longer and longer. And if it's not already, this Colores de Carol shade should be at the top of yours! Hello loves! I'm really excited about today's post because it's the first of many to come just like it. I am really lucky to be an official swatcher for the Road To Polish Con series leading up to Polish Con New York 2018 coming this June. I have yet to get the chance to attend a convention, but it's a big goal of mine! In the meantime since I can't go and meet all the makers, each week I get to try out new-to-me brands and share them with you! So make sure to tune in every Friday to check out the different offerings from each vendor attending the convention. Hello lovelies! Today's post is short and sweet. I have just one stamping plate to share with you- the UberChic Beauty Got Chevron 02. The images I chose were giving me some trouble initially using my firm clear stamper. I decided to try my sticky and squishy stamper and that helped me get the images perfectly. I am really happy with both these looks and hope you enjoy..
Hello friends! Today's post features a new-to-me brand (though I've been wanting to try them for some time), Savannah Lacquer. 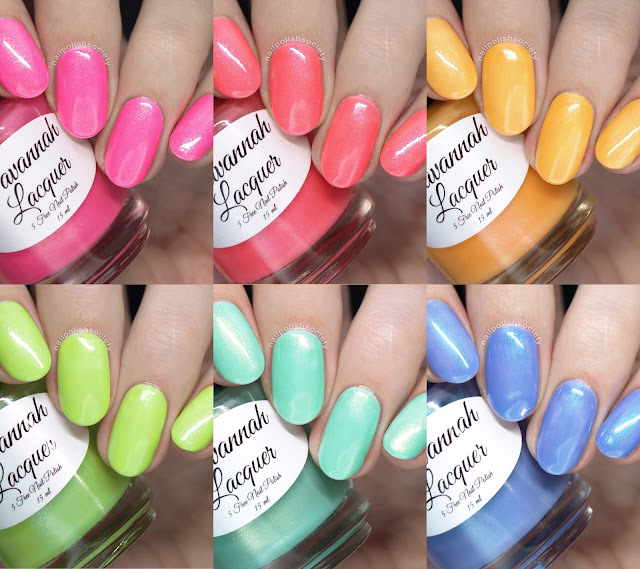 The Salt Water Taffy Part 2 Collection consists of six beautifully bright pastel neon shimmers. I am a little obsessed with this color palette! 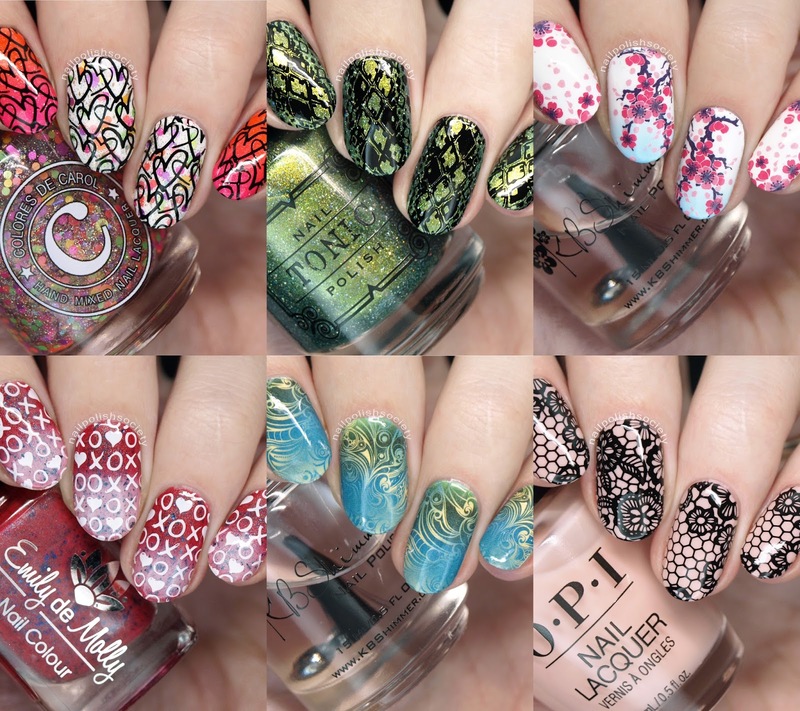 These polishes were designed to watermarble so the formulas are very sheer jellies. Because I don't really like my visible nail line I swatched each one over a white base. It still required three coats of each shade to get the color evened out. Unfortunately the white base made my photos hide the shimmer more than it's visible in person. Hello lovelies! Today's post is a rare one- a gel polish review! I reviewed Madam Glam's gel polish once before last year (here) and I'm at it again. I am still a gel polish newbie and honestly am still trying to get my technique right. So I'm not going to get detailed on the formulas as I don't have anything else to compare to. Happy Friday everyone! I have eight new shades from Emily de Molly to show you today and I think you'll fall in love with one or two.. or more like I have! The formulas were all great and I didn't have any issues. Let's take a look..
Ni hao and dia dhuit to you! 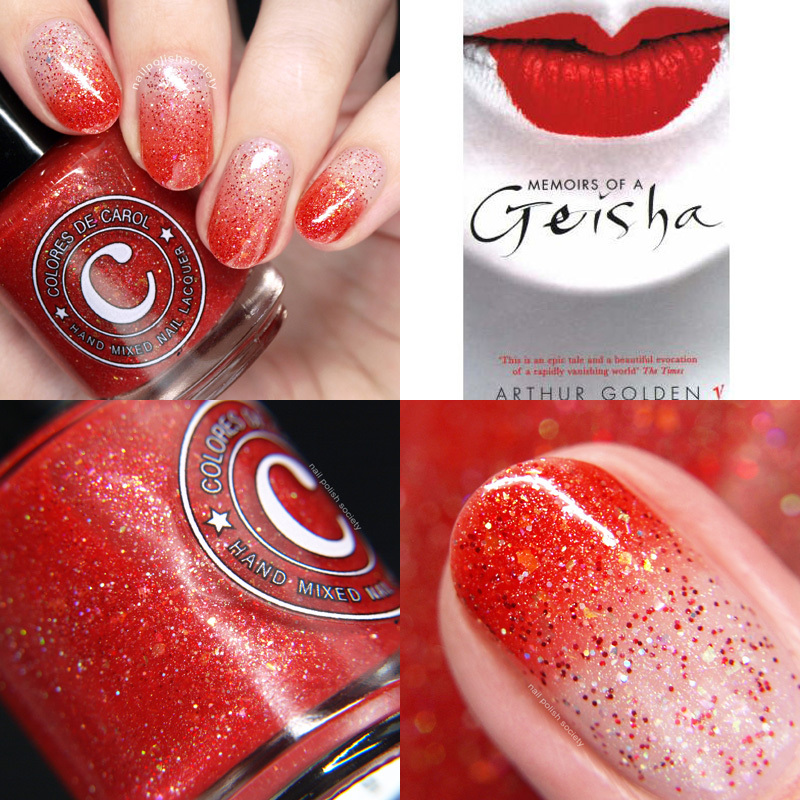 Colores de Carol has created three fun and festive internationally themed polishes. First up is a St. Patrick's Day duo and then a Chinese New Year glitter topper. Let's start this party! Hello friends! 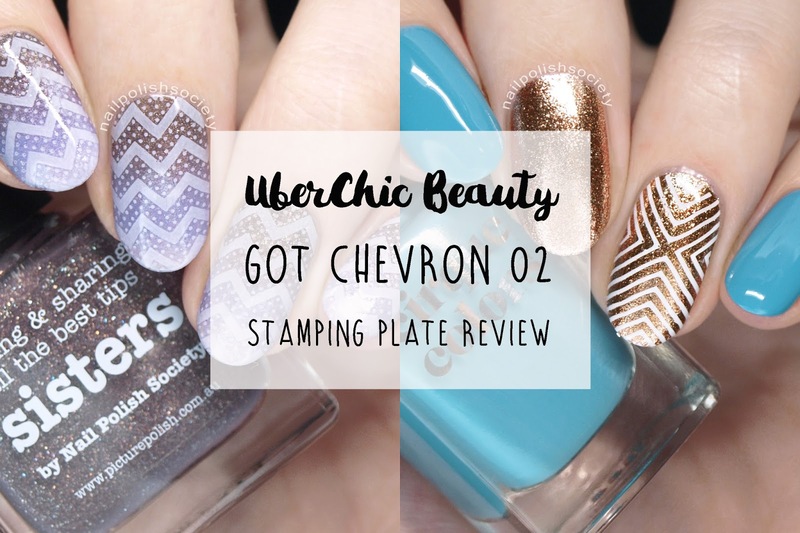 Today's post is a review of new stamping plates and water decals from What's Up Nails. I had really good success with each one and am very pleased with the looks I've come up with. I hope you enjoy them too..
Hello lovely Valentines! It's that time of year where everything is swathed in pinks and reds and twitterpation is in the air. Well, maybe not for everyone, but romantic love isn't the only reason to celebrate Valentine's Day. I've always found it a fun holiday to show my affection to friends and family, and hopefully receive some in return.